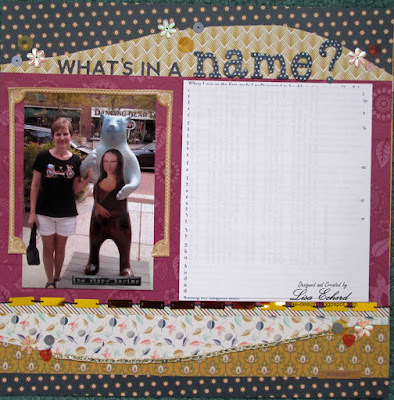 Lisa E Design Blog: What's in a name? My mother swears she named me after the Mona Lisa. I did not believe her because Lisa was such a popular name in the 1960's. There were always other Lisa's in my class at school. In one of my high school classes, 5 of us were named Lisa. The Mona Lisa had been around for centuries. Why would it suddenly be a popular name? Mother says that she was doing dishes one night and Daddy had the news on. She heard on the news that the Mona Lisa would be coming to NY for a showing. She decided then if she ever had a daughter, she would name her Lisa. The Mona Lisa did come to NY for a showing a couple of years before I made my showing. I just didn't know that for several years. The reason I doubted her is that there was a popular soap opera character on As The World Turns named Lisa. She was played by NC native, Eileen Fulton. I thought she must have named me after that Lisa or because it was so popular. I'm sorry I doubted her. She and my father did get to see the Mona Lisa in Paris in the late 1970's. She probably didn't expect that to happen when she was washing her dishes in her kitchen in NC in 1962. My page about this starts with a present day photo. Here's the process video for the page. Thanks for visiting and for all the positive feedback on my videos. Great page. I would include the size of your HS class. 5 Lisa's out of ?. For this class, there were about 20-25 students in the room.